First impressions are very important. I've found that I can't really judge a DDR until I've at least played all the songs on basic and then moved on to replay the songs on Trick, but Dance Dance Revolution 5th Mix gave me the impression that it left a lot to be desired. I started playing DDR with 3rd Mix, and I have worked my way forward and back through virtually all of the Playstation, Dreamcast, and Game Boy Color mixes - so I've become pretty set in the types of songs that I like to groove to. I like medium- to fast-beat songs that I can really get into and move my body to. The problem that I personally found with 5th Mix's Basic mode is that the game is pretty much stacked towards slow songs. This may be beneficial to beginners, but the songs really try my patience because I have to keep myself from jumping ahead. On Trick and Maniac, however, that flaw doesn't enter into the equation. The core of any DDR game is always the music. 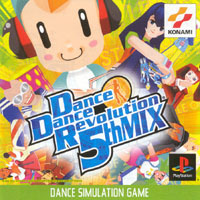 In the past, DDR games have sported a collection of songs which have primarily been remixed 70s and 80s music thrown in with some J-Pop, R&B, Techno, and Konami original music. This latest installment is quite possibly the most internationally based of any of the DDRs to date. The biggest additions are the full-length songs, which literally count as two songs and can yield some insanely high combos, if you manage to survive the endeavor. As an added bonus, whenever you go over 100 combos, the arrows explode in cool starburst patterns. I've found that the most fun songs in this mix are Dancing All Alone, Test My Best, Dive, Never Ending Story, and Nori Nori Nori. I also like the fast beats of Afronova Primal and Paranoia Eternal, and I enjoy the varied BMP of Healing Vision and Insertion. Speaking of Insertion and similar songs, they bring a nice taste of originality to 5th Mix. They shake up the normal game play by adding a much harder speed-up and slow-down cycle to the songs. To further complicate matters, the mid-step pauses give a much needed skill level booster, because it forces the player to keep the beat in dead silence so that he or she can hit the arrow at the right moment when the arrows start up again. Visually, the characters on the screen either pause or do a bit of special mid-air effect in songs like Ecstasy. This latest installment features a completely new interface that takes some style elements from 4th Mix and brings them into more of a rave-like atmosphere, with redesigned characters and new backgrounds. Naturally, I wasn't expecting major improvements in the graphics, but this game seems like good step-up from the past games. Although the characters are a bit more jagged, they don't blend into the backgrounds as badly or interrupt the arrows as much as they used to. The backgrounds are a lot more static due to the higher resolution used to render them. The arrow movement is a lot more fluid and easier to dance to, not only because you can see that the arrows are not embedded into the backgrounds, but because the backgrounds have a completely different flow and style to them. Unlocking the secrets in 5th Mix is a pretty straightforward task; all you have to do is successfully complete songs. In fact, in this game you don't even have to complete a full set of songs to unlock secrets, as you did in previous games. All you have to do this time is play a song, and it pretty much unlocks something. Early on, you get extra songs and pictures in the massive DDR photo gallery, which serves as a short of history of the series and merchandise. Later on, completing songs unlocks extra modes and features. So the more you dance, the more stuff you open up. The replay value in DDR really stems from beating your high scores, though, so it never really gets old. I find myself constantly playing other DDR games in a massive dance-a-thon whenever I play. Whether you like it or not, 5th Mix is the latest installment in one of the most original series ever, and it will tide every dance fiend over for the time being. DDR's moment in the spotlight may be slowly drawing to a close now that Dance Dance Revolution Max (aka DDR 6th Mix) is out in the arcades, but take comfort in the fact that other Bemani games like Para Para Paradise will carry on the legacy.